There’s an old saying that all films are made at least three times: once, when the screenwriter commits the story to paper; again, when the director captures the story on film; and finally, when the story is constructed in the editing room. At best, this method can allow for a margin of creativity that improves a final product. At worst, it can allow too many cooks to add ingredients to the proverbial broth, and the film can become a compromised mess. Then there are films like His Kind of Woman which defy any sort of coherent creative process. Released by RKO Radio Pictures in 1951, His Kind of Woman was a film that suffered endlessly at the hands of the studio. Scenes were rewritten, characters were recast, and the majority of it was reshot after production had already wrapped. It fuses film noir and screwball in completely nonsensical ways. It’s overtly violent at times and incredibly hammy in others. It’s also way more entertaining than it has any right to be. In an effort to determine how such an enigmatic film was made, I’m going to break His Kind of Woman down into its respective act– each of which, according to record, reflect the input of a different creator. 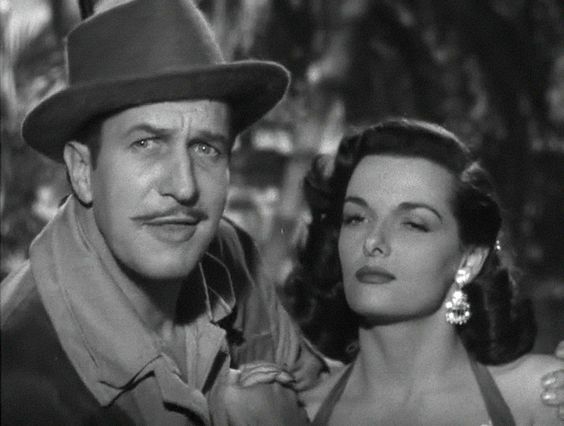 The first draft for His Kind of Woman was actually styled as a traditional film noir. 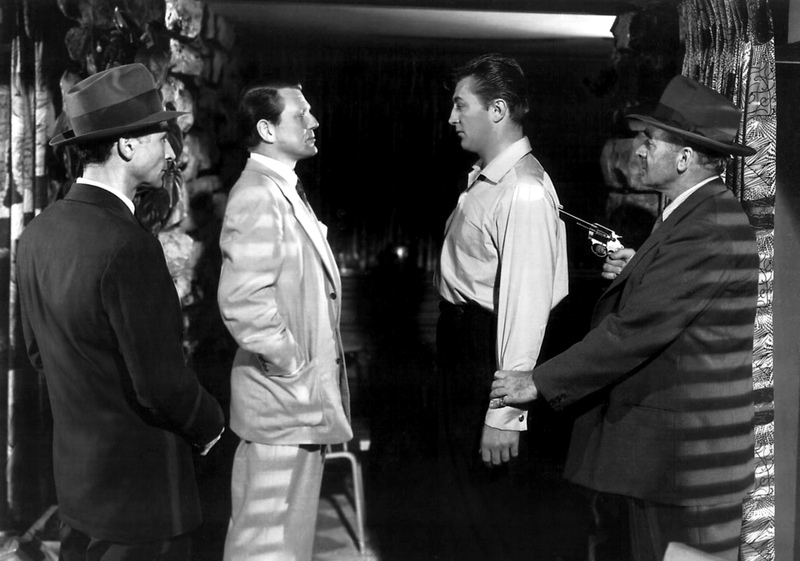 Screenwriters Jack Pearson and Earl Fenton (uncredited work on Nocturne and Out of the Past) penned a story that had all the obligatory bells and whistles: gangsters, gunplay, and plenty of choice dialogue for star Robert Mitchum to rattle off while looking cool. The film’s opening scene plays on this, with its seamy Los Angeles backdrop and hoodlums who’d just as soon brawl as they would play a game of cards. In the case of Dan Milner (Mitchum), he’s treated to the former — the price of being an amateur gambler, and a bad one at that. But things seem to turn around when he’s offered $50,000 cash. The catch? That he go down to a resort in Mexico and make good on an undisclosed “favor” for a mysterious client. Milner smells a rotten deal, but like any self-respecting sap in a film noir, he takes the bait anyway. 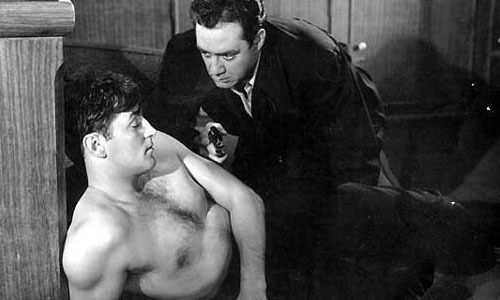 John Farrow was hired to direct after handling Mitchum’s previous hit, Where Danger Lives (1950), and his tight, economic pace is evident in these early scenes. Note the way he lingers on empty diners and hotel rooms, establishing mood through grim silence. Unmistakably film noir. Once Milner boards a plane to Mexico, though, you can feel Farrow’s grip being pried from the wheel and replaced with that of the film’s eccentric producer, Howard Hughes. Hughes was reportedly unhappy with Farrow’s vision for the film, and decided to overhaul production in an effort to create something that was more commercially viable for his stars. He ordered Pearson and Fenton to rewrite every single scene that took place after Milner arrived in Mexico. It’s anybody’s guess as to what occurred in the original draft, as the rewrites completely diffuse tension by adding silly characters and a ton of romantic detours. Generally speaking, this is a good way to destroy a film noir. There have been so many instances where a noir opens in the city, establishes a sharp tone, and then nullifies it with a second act that turns their characters into bland heroes. Passed off as an attempt to humanize the characters, it mainly succeeds in making them less compelling. Watch Desperate (1947), Dark City (1950), and the maddening waste that is One Way Street (1950) to get a better understanding of what I mean. The main reason His Kind of Woman avoids this curse is that it doesn’t take its radical shift in tone seriously. It reinvents itself as a screwball comedy seemingly on the spot, with Milner poking fun at some of the guests (Jim Backus is a hoot as a skirt-chasing stockbroker) and trading barbs with sultry lounge singer Lenore Brent (Jane Russell). The two create tangible friction, even as Brent attempts to woo rich actor Mark Cardigan (Vincent Price) from his estranged wife. Mitchum and Russell’s chemistry (which I go into more of here) is superb, but really, it’s Price’s hammy Cardigan that steals the show. While Mitchum is forced to remain the straight man and play detective, Price is allowed to run wild as a character desperate to trade his “phony” hero image in for the real thing. The scene where Cardigan screens his latest swashbuckler at the resort is arguably the film’s most memorable. The hopeful star sits behind the crowd, eagerly scanning to see if their enjoyment equals his own. At one point, he stands up and claps at his character’s victory, only to recoil in silence when he realizes he’s the only one doing so. The chilly response he gets from Brent (“Oh it was fine, it was just a little long. About an hour and a half.”) and a miserly doctor (“It has a message even a pigeon wouldn’t carry.”) make for some of the best one-liners in the film. As Milner is taken captive by gangsters, however, Hughes and Fleischer show just how far they were willing to go off the beaten path and into unchartered territory. There have been films noir climaxes that are more brutal perhaps, or more comedic, but never one with scenes this wildly juxtaposed, and somehow integral to one another. Milner learns that deported kingpin Nick Ferraro (Raymond Burr) plans to steal his identity and reenter the U.S. using plastic surgery. He also decides to strips Milner of his shirt, tan his back with a leather belt, and aim a pistol at his unconscious body. We then cut to a lake, where Cardigan is prepping a rescue mission. He’s armed and enraged over Milner’s capture. He’s also wearing a cape, quoting Hamlet, and sinking in a paddle boat with a fleet of Mexican policeman. “My kingdom for a ship,” he mugs at the camera, “Now would I give a thousand furlongs of sea for an acre of barren ground!” They eventually make it to Ferraro’s ship, where things devolve into a feverish clutter of pratfalls and violence. Milner gets the girl, Cardigan gets to be the hero, and the film closes on a fittingly nonsensical shot: a pair of trousers burning under an iron. Sounds about right. In his 1991 autobiography Just Tell Me When to Cry, Fleischer claims that the film took two about months to reshoot, including the scenes with Burr, who replaced original actor Robert J. Wilke at Hughes’ behest. 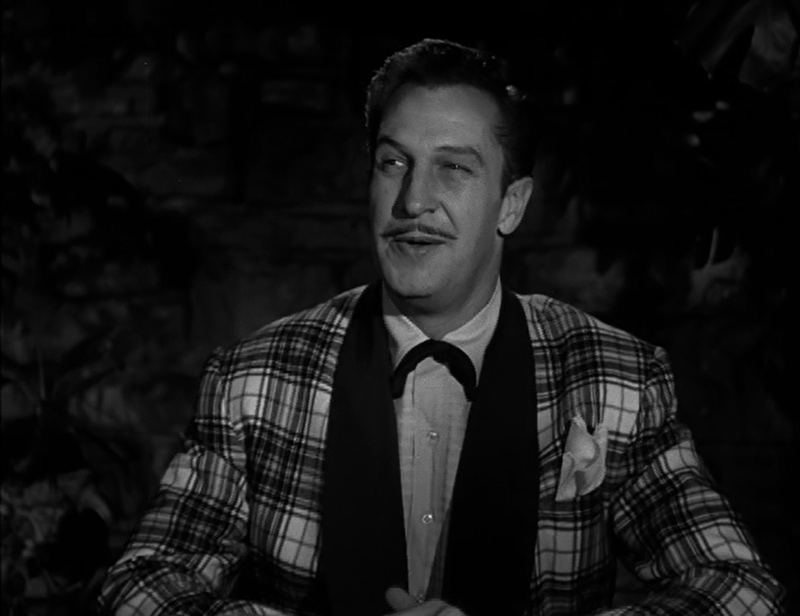 The footage was then pieced together with scraps from Farrow’s abandoned cut, and His Kind of Woman premiered in August 1951, over a year after its initial completion. Audiences were throughly confused by the film when it was released, and it lost a reported $820,000 at the box office (roughly the same amount Hughes spent on reshoots). The confusion holds up even today. It’s a fantastic mess of a film, with plot threads coming and going as they please, and actors emote as though they’re in different genres altogether. TRIVIA: Hughes had to pay $15,000 to reshoot the scene where Cardigan and the police sink in the rowboat. This entry was posted in Film Noir Review. Bookmark the permalink. Thanks for this post. I’ve seen HIS KIND OF WOMAN at least six times and enjoyed every viewing. I always knew it was a tangled mess and you did a great job of untangling why it works despite everything that’s wrong with it. Thanks for the kind words! And I’m glad you enjoy the film as much as I do, it’s a big mess but that’s definitely part of its charm. I think I have seen this film at least once. It wasn’t a particularly memorable film, but it did have both Mitchum and Russell, two of the most attractive people in the history of classic film. I’ll admit it was a little underwhelming when I first saw it, but it has a strange charm to it on repeat viewings. 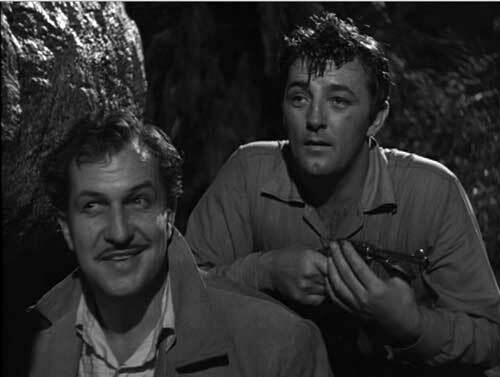 And the chemistry between Russell and Mitchum is off the charts. Wish they had made more films together. I’ve never seen this film – I’m going to have to give it a watch. I love it when a film changes it’s tone in the middle – it’s so hard to do it successfully. This is one of the few Vincent Price films I haven’t seen. Thanks for this posting. Enjoyed reading it. Thanks so much! And if you’re a Price fan I highly recommend it, its a side of him you don’t really get to see elsewhere.